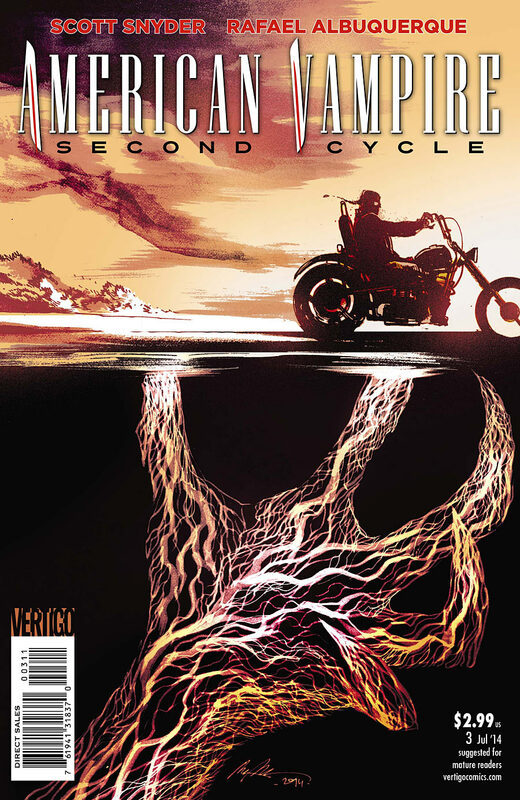 This third arc of Zero Year: Savage City is quickly shaping up to be the most compelling segment of Scott Snyder’s and Greg Capullo’s bold reimagining of Bruce Wayne’s early career. Their new take on the classic elements from the Dark Knight‘s mythology has constantly impressed on all levels. Now we see the total sum of the Riddler’s master plan coming to fruition, as Batman, Gordon, and the people of Gotham must find a way to rise to the Riddler’s challenge in order to survive the post-apocalyptic urban wilderness Gotham City has become. Having recovered from his injuries Batman has now returned to assist Lieutenant Gordon, and together with the help of Lucius Fox they begin to formulate a plan to track the Riddler’s signal and uncover his actual location. Batman must confront the Riddler with a puzzle as he makes his daily address to the city on a giant screen. Timing will be crucial for their plan to succeed and Batman will be tested to the limit as he challenges the Riddler at his own game. The final act continues to gather momentum in Batman #31 as Zero Year sees the Dark Knight and his new allies, Jim Gordon and Lucius Fox, finally working together against the Riddler. Scott Snyder sets up a great confrontation between Batman and the Riddler in part ten of Zero Year. In an extraordinary battle of wits, skill, and endurance, the Dark Knight’s verbal sparing with the Riddler is superb, and the physical challenges Batman has to face beneath the coliseum are some of the most intense and exciting scenes we’ve seen so far in Zero Year. From its stunning cover featuring Batman overlooking the Gotham skyline from his high vantage point, with his new costume for Savage City illuminated in the twilight haze, through to the astonishing level of detail in every scene that follows Greg Capullo’s art for Batman #31 is simply stunning. Capullo’s depiction of a Gotham City flooded and overrun with dense vegetation is superb, the ravaged buildings, together with the underlying sense of decay and despair, utterly immerses you within the harsh reality of this rundown ecosystem. Danny Miki’s inks and FCO Plascencia’s colors are as incredible as ever, and they complement Capullo’s art perfectly. Batman sure knows how to make an entrance, and this issue is no exception as it delivers a real, punch the air: “hell yeah! !”, moment that will leave you with a very big grin on your face as he arrives to confront the Riddler. I also really liked the way Snyder and Capullo intertwine the event in Batman #31 with the flashbacks where Bruce’s teacher at school gives him a problem to solve as Batman is challenging the Riddler in Zero Year. It highlights the incredible synergy that Snyder and Capullo have brought to their run on Batman, and the way in which the many elements of Zero Year are beginning to draw together is truly inspiring – it works on so many levels, and you get a real sense of things building towards an epic conclusion. The makeshift Bat-suit that Bruce has put together is another highlight of this issue. This is a Batman ready for war, a Dark Knight on a crusade to reclaim the city he has sworn to protect. Essentially comprised of clothes that he has just thrown together, it illustrates that Batman is much, much more than simply the suit he wears. In many ways he doesn’t even need the costume or the gadgets, Bruce is Batman, with or without the costume, the Dark Knight is the very essence of his being, and the way he continues to modify the outfit this issue transcends everything we have seen before. Batman #31 is a terrific issue, exciting, and brilliantly tense, Batman ends up facing his toughest challenge yet of his early career. The way Batman puts his final question to the Riddler totally sums up the issue for me, tough as nails, and never, ever, prepared to back down; no matter how impossible the situation or complex the puzzles solution might be. This is why I’ve always loved reading Batman comics since I was a kid, this is why I think Snyder and Capullo are so freaking awesome at what they do, and this is why I’m enjoying Zero Year so much. New Series of Doctor Who Starts August 2014! 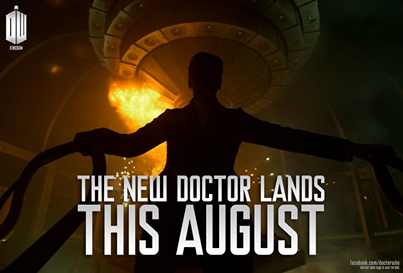 The new series of Doctor Who lands on BBC1 this August! Check out the first teaser trailer! The Doctor (Colin Baker) and Peri (Nicola Bryant) arrive at Tranquil Repose on the planet Necros, where a facility run by Mr Jobel (Clive Swift) is used by some of the wealthiest people in the galaxy to cryogenically freeze their remains, until a time where the aliments that caused their deaths can be cured. The Doctor wants to pay his last respects to his old friend, Professor Stengos (Hugh Walters). However, when they are attacked by a horrific mutant (Ken Barker), the Doctor’s suspicions about Stengos’ death are confirmed. When they arrive at Tranquil Repose the Doctor is almost crushed by a huge memorial that has been fashioned in his own likeness. Once inside Tranquil Repose the Doctor is captured by a new breed of white and gold Daleks that have been created by Davros (Terry Molloy). The creator of the Daleks has adopted the identity of the Great Healer so he can use the frozen bodies stored at Tranquil Repose to secretly build a new Dalek army. Davros runs his operation from deep in the catacombs. His head is stored in a tank, which now acts as his life support system, and he can monitor everything that happens on a sophisticated bank of computer screens. When Jobel openly challenges his authority, Davros has the chief embalmers assistant, Tasambeker (Jenny Tomasin), brought to him. 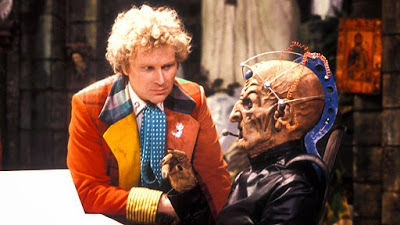 Davros manipulates Tasambeker into helping him, using her infatuation with Jobel get her to kill him. Peri manages to avoid Jobel’s lecherous advances by making friends with the facilities resident DJ (Alexi Sayle). The Doctor finds himself imprisoned with Stengos’ daughter, Natasha (Bridget Lynch Blosse), and her friend Gregory (Stephen Flynn), who broke into Tranquil Repose so Natasha could find out what really happened to her fathers body. After finding his cryogenic chamber was empty, they later discovered his severed head growing inside a transparent Dalek casing. In a moment of lucidity, Stengos begs his daughter to kill him, rather than let himself become a Dalek. Natasha used her gun to vaporise her fathers head, but afterwards she was captured along with Gregory, and tortured by Takis (Trevor Cooper) and Lilt (Colin Spaull). It would seem that Davros has made some great enemies during his stay on Necros. Having invented a food substitute to eliminate famine throughout the galaxy, by processing the corpses frozen in Tranquil Repose, the Great Healer forged an alliance with Kara (Eleanor Bron) and her assistant Vogel (Hugh Walters) to manufacture the food paste in her factory complex. But she has grown tired of Davros’ demands, and decides to kill him. Kara hires an assassin from The Grand Order of Oberon, Orcini (William Gaunt), and his squire Bostock (John Ogwen), and gives him a bomb to destroy the Great Healer and Tranquil Repose. Kara’s plan is quickly discovered by Davros, he sends a squad of Dales to bring her to him, killing Vogel when he resists. After defeating a patrolling Dalek Orcini breaks into the facility, freeing the Doctor, who leaves Natasha and Gregory to destroy the incubation room – but they become trapped and are killed by a Dalek. Peri and the DJ try and hold off the attacking Daleks, but the DJ is killed and Peri is captured by the Daleks. Orcini and Bostock attack Davros in his lair, but the head in the tank is actually a decoy, and the real Davros is hovering behind him. The Daleks attack Bostock and shoots off Orcini’s artificial leg, leaving Davros to swoop in and blast Orcini with bolts of energy from his hand. The Doctor and Peri are brought before Davros, who gloats about his imminent victory, Kara’s treachery is also revealed and Orcini stabs her in the heart. 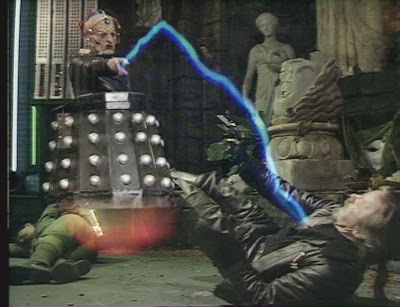 Bostock manages to shoot off Davros’ hand before he can activate his Dalek army. The Daleks kill Bostock and rush to protect Davros. Chaos ensues as a squad of Daleks arrive from Skaro, having been called by Takis and Lilt, and it transpires that the Dalek Supreme wants Davros taken alive so he can be punished for his crimes. Season Twenty Two was Colin Baker’s first full season as the 6th Doctor. His new Doctor was initially quite unstable, and constantly at odds with his travelling companion Peri, but by the time of Revelation of the Daleks (1985) they are getting along much better. Colin Baker and Nicola Bryant give terrific performances here, there is a touching moment where the Doctor is confronted by his own gravestone, and Peri proves to be just as resourceful as the Doctor when they are separated at Tranquil Repose. The Doctor also has a great confrontation with Davros, where the Time Lord is visibly disgusted by what lengths Davros has gone to build his new Dalek Empire. Eric Saward’s script for Revelation of the Daleks contains elements of Evelyn Waugh’s The Loved One, a satirical novel about a funeral business. Revelation of the Daleks is also bleak and full of graphic horror. The scene where Natasha and Gregory discover Stegnos’ head growing inside the transparent Dalek are some of the most horrific in the shows history. Add to this the morbid setting of Tranquil Repose, the unsettling way Jobel behaves towards his staff, and the horrific practice of corpses being used to create Dalek mutants and processed food in Kara’s factory, it becomes clear why Season Twenty Two was heavily criticised for its excessive levels of violence. Much as I enjoy the grittier stories in Doctor Who, sadly this trend of increasingly dark stories also led to the show being put on hiatus by the BBC at the end of the season, so we lost the stories already in development for Season Twenty Three – they were replaced by The Trail of a Time Lord when Doctor Who returned in 1986. Revelation of the Daleks has an impressive guest cast, many of whom play a pivotal role in the action. Tassambeker’s unrequited love for the slimy Jobel is quite unsettling, and Jenny Tomasin and Clive Swift really hold our attention as their macabre relationship is manipulated like a plaything by Davros in his lair. Elanore Bron is supremely elegant as the scheming Kara, whose plan to kill Davros takes up most of the story, and ultimately leads to her being killed by the very assassin she hired to do her dirty work for her. 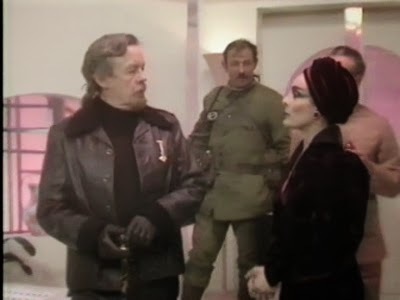 William Gaunt steals the show from everyone as Orcini, a Knight of the Grand Order of Oberon, who, along with John Ogwen as his faithful squire Bostock, accept Kara’s mission for the honour of killing Davros. Terry Molloy is simply magnificent as Davros in Revelation of the Daleks. When we first see the decoy in the tank, it would appear that this is all that remains of the Daleks creator. It’s quite chilling to observe him as he watches events unfold around him, with Davros sitting in the middle of events like a great spider in a web, slowly drawing his victims to their doom. Admittedly, his plan to lure the Doctor into his trap does seem somewhat extravagant, but having worked in secret for so long it would seem that Davros has become even more deranged. He cackles maniacally, spitting orders as his head swivels in its tank, manipulating everyone around him. Of course this is all a ruse, the head is just a decoy for the assassins bullet, and when Davros is revealed his chair can now float and he can shoot bolts of energy from his hands and sensor array. Molloy exudes pure evil as Davros, especially in his exchanges with the Doctor, and it seems he has been monitoring the Time Lord for some time. 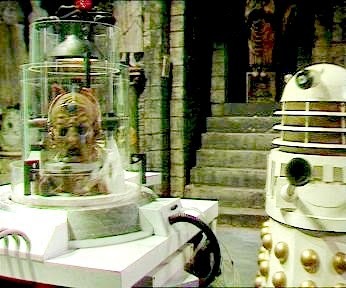 Even after he loses his remaining hand, Davros refuses to give up, ranting at the Daleks loyal to the Supreme Dalek, telling them that he can make them all supreme Daleks if he so desires. The forty five minute formant adopted for this season really plays to the strengths of Revelation of the Daleks, there is virtually no padding in this story, and the plot thunders towards its epic climax in the second episode. 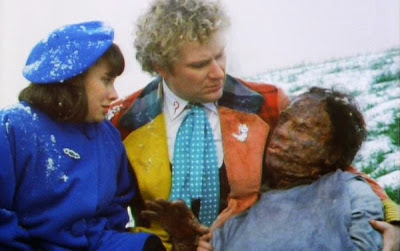 A sudden snowfall meant that the location scenes were filmed in the snow, which really helps build an eerie atmosphere, and it makes the Doctor and Peri’s encounter with the Mutant even more terrifying. The Doctor and Peri also wear striking blue cloaks for the early stages of the story. Once we reach tranquil repose the interior sets are also impressive, especially Davros’ lair deep in the lower levels of the catacombs. The action set-pieces where both factions of Daleks are fighting are brilliantly choreographed by director Graeme Harper; you really get the sense that you are in the thick of the action, and the body count it shockingly high. Although it takes a whole episode for the Doctor and Peri to get involved in the story, this is still one of their best adventures, and it really gives Colin Baker and Nicola Bryant a chance to shine as they battle against the Daleks. Eric Saward’s story is full of fantastic characters, all trying to outwit and deceive each other, yet ironically nearly all of them end up being killed. 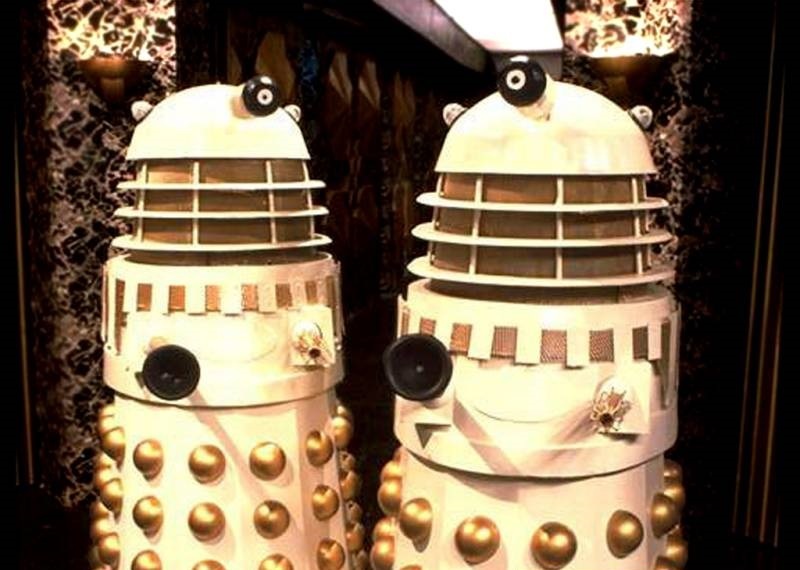 The new white and gold Daleks look really good as well, although their voices are strangely muffled. Graeme Harper often films them close up, making them seem even more menacing, especially when they glide around inside Davros lair. Revelation of the Daleks is my favourite 6th Doctor story, it’s an incredibly dark and violent adventure, and it should have paved the way for another great season. As it is we will never know what could have been. Soon the show would face a long hiatus, production difficulties would disrupt The Trial of a Time Lord, ultimately leading to the recasting of the Doctor. I think it’s a real shame that Colin Baker’s tenure ended so abruptly, as it would have been great to see the 6th Doctor battling the Celestial Toymaker and the Ice Warriors. Fortunately the Big Finish audio adventures have given us the chance to enjoy Colin Baker’s Doctor once more, with scores of memorable stories; they have helped create the legacy that the 6th Doctor so rightly deserves. 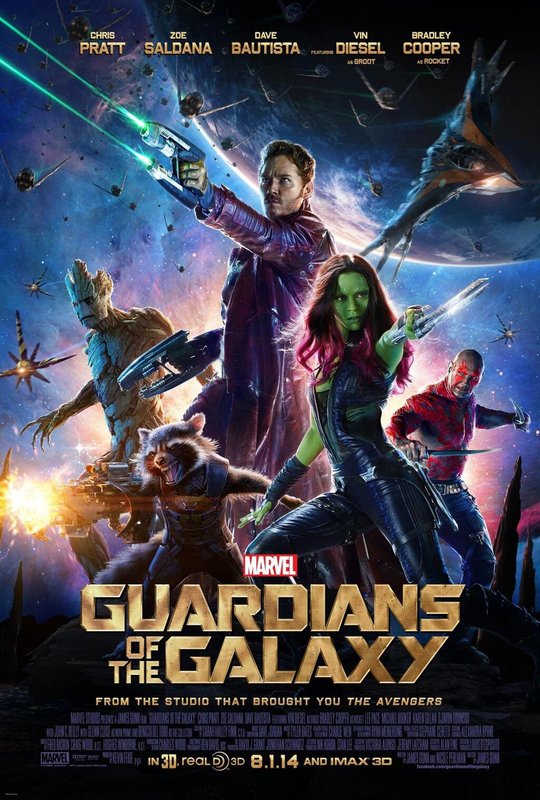 Check out the new trailer Marvel have released for Guardians of the Galaxy! Sorry, the trailer seems unable to play atm, so I’ve put the link to Marvel’s Guardians of the Galaxy Facebook page for now. CW’s The Flash New Extended Trailer! Following the great teaser trailer, the CW have released the full trailer for The Flash! Check out this great new preview (over5 minutes long) Can’t wait for this series, it looks awesome! New Trailer for Transformers Age of Extinction! 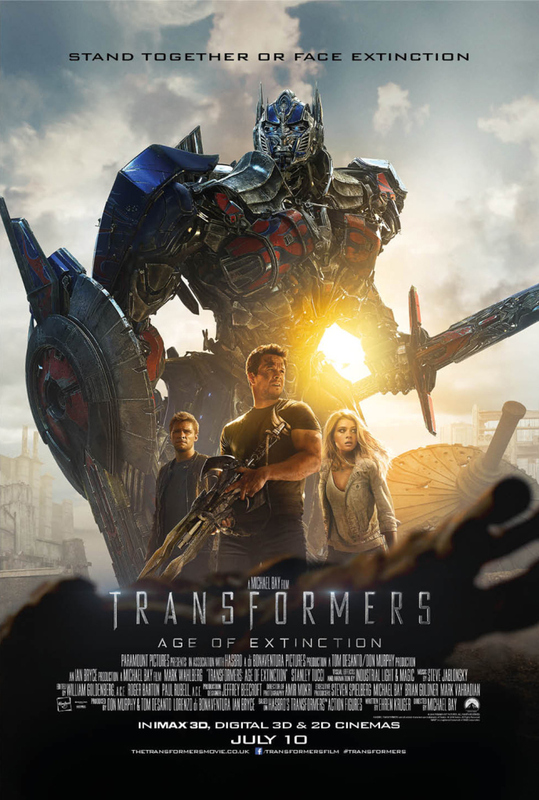 Check out the awesome new poster and official trailer for Transformers Age of Extinction! 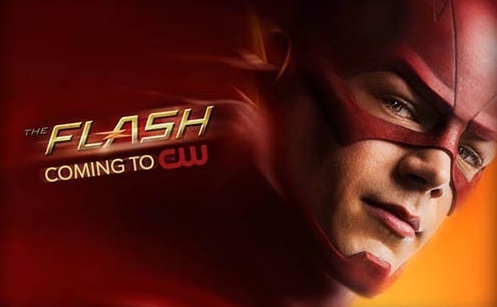 CW’s The Flash Series Trailer: First Look Don’t Blink! 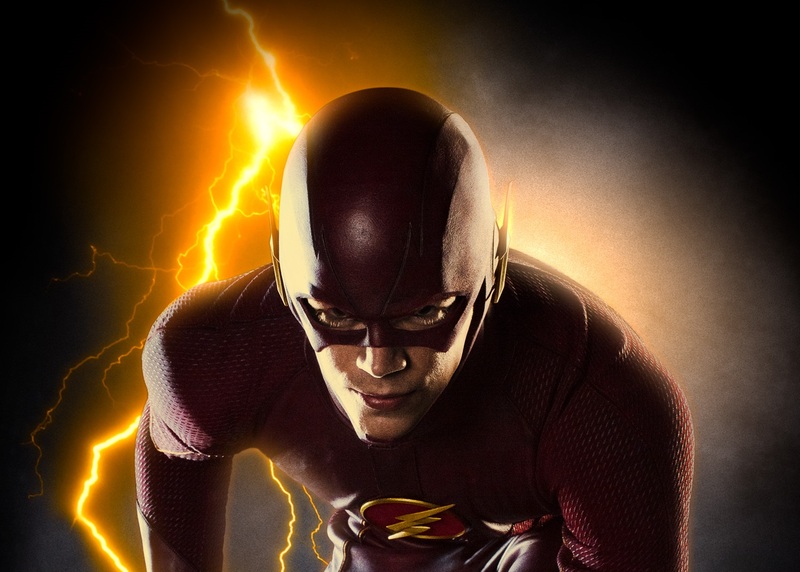 Check out the first trailer for CW’s The Flash: First Look Don’t Blink! The Flash is on the way! The Season 2 finale of CW’s Arrow shown on Wednesday night also featured the first teaser trailer for the new spin-off series, offering us our first look at Barry Allen (Grant Gustin) as the Flash, as he outruns one of Oliver Queen / the Arrow (Stephen Amell’s arrows. Check out the teaser trailer and the new synopsis the CW have released for the show. Events shift into the realm of the supernatural in Batman Eternal #6 as the Dark Knight must divide his attention between the gang war and the macabre horrors unfolding in Arkham Asylum. With Jim Gordon now locked up in Blackgate Penitentiary after being refused bail, Batman knows Commissioner Forbes will do nothing to prevent the escalation in hostilities between Falcone and the Penguin. Following Jim Corrigan’s visit to Wayne Manor, Bruce decides to send Batwing to Arkham with Corrigan while Batman concentrates on keeping Falcone’s forces off the streets. 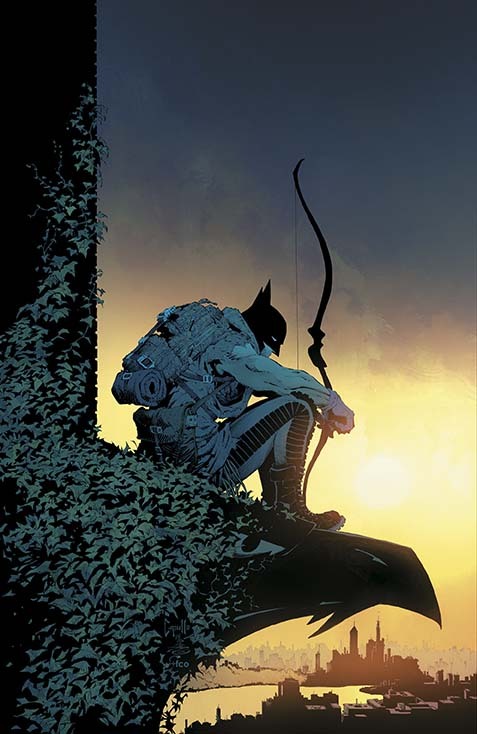 “The Denied” is a great story by Scott Snyder & Jams Tynion IV, with script by John Layman’s script, and consulting writers Ray Fakes and Tim Seeley. In many ways Batman Eternal #6 is a refreshing trip to the dark side, especially after last issue, when Red Robin’s investigation into the outbreak of a nanobot swarm in the Narrows of Gotham, where Harper Row’s brother, Cullen, became infected by the swarm. 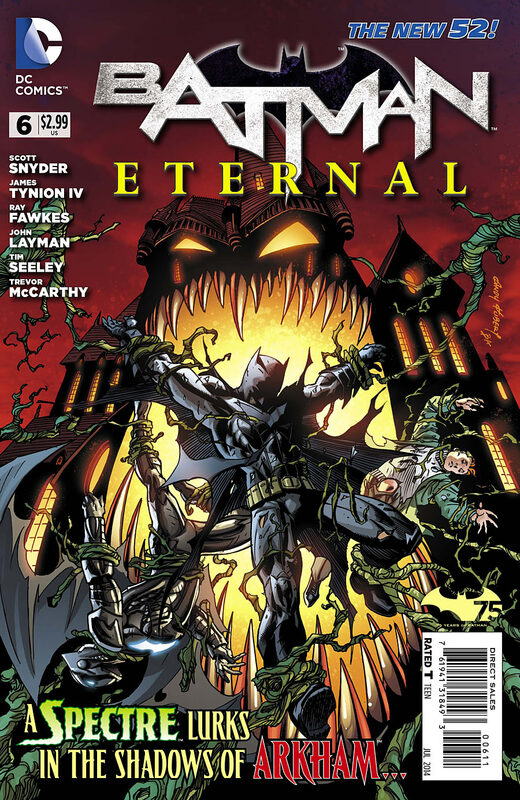 Batman Eternal #6 shows just how flexible and innovative the format of a weekly series can be, allowing the writers to explore a wealth of characters, storylines, and situations. Although the focus may have shifted to Batwing’s and Corrigan’s mission to Arkham Asylum, while Batman deals with the crime war, the narrative of the main story arc with Gordon is never far from our minds as it bubbles away in the background. Its good to see Batwing featuring in Batman Eternal #6 as well, he has some great scenes battling the Gentleman Ghost, the character also works really well with Batman, and I like the banter with Corrigan as well. Batman is also quick to point out to Batwing that his over reliance on his suits sensors won’t always work for him, and that sometimes you have to look beyond logic and reason to deal with the creatures that stalk the dark corners of Gotham’s underworld. I think Batwing and Jim Corrigan will make a great team as they explore Arkham Asylum, with Batwing’s hi-tech suit and Corrigan’s expertise with occult forces, it will be interesting to see how they work together as they prepare to face the dark forces lurking within Arkham. Batman Eternal #6 features some terrific artwork by Trevor McCarthy. From the urban sprawl of the deserted truck yard to the library inside Wayne Manor, McCarthy captures the darker tone of this story perfectly. The scenes inside Arkham are wonderfully dark and macabre, as we descend into the nightmarish lair of horror and death below the Asylum, an unexpected appearance awaits us as another unfortunate inmate meets his fate. The colors by Guy Major are also excellent, Dr Phosphorous looks incredible, his skeleton boiling in shimmering green flames, leaving glowing footprints and handprints in his wake as he wanders the tunnels. The scene outside Arkham Asylum is also really atmospheric; as Batwing and Corrigan stand on a hilltop with the sun setting behind Arkham. With its dark, brooding atmosphere, Batman Eternal #6 is a terrific issue, steeped in the supernatural; it builds to an explosively orchestrated climax. Batman Eternal continues to go from strength to strength, with every issue expanding the scope and scale of the story and characters. This weekly series is has me completely hooked! First Image of Ben Affleck as Batman! 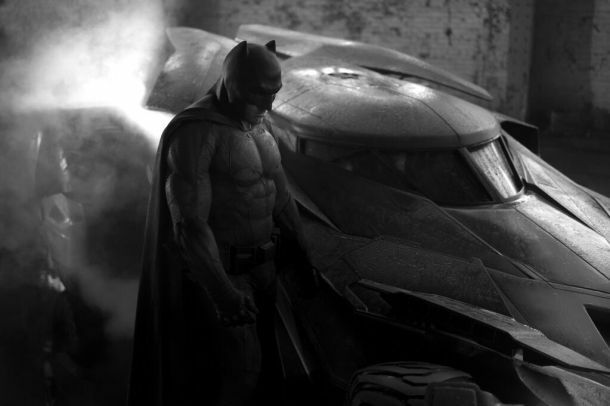 After offering us a glimpse of the new Batmobile, Zack Snyder has now tweeted a new picture of Ben Affleck as Batman standing next to the Batmobile! The new Batsuit certainly looks good!